If ever there was a cake decoration flower, it is the kalmia. The buds look pretty much like piped icing rose buds right through to the point where they finally open to a pastel shaped cup with deeper colouring on the underside. These flowers are also successful cut for a vase indoors, lasting a fair time in water. Kalmias are evergreen members of the heath family, growing here in similar conditions to rhododendrons (they like an acid soil) and coming into flower just as the rhododendrons are largely over. They are native to the eastern seaboard of North America from Canada to Mexico so are tolerant of a wide range of temperatures but generally we would describe them as very hardy. Americans often refer to them as the Calico Plant or Mountain Laurel. Over time, they will grow to about 1.5 metres high but they are pretty slow growing. Kalmias are not rare but they are not often available in garden centres simply because they are notoriously difficult from cutting. Sometimes plants will come in a rush through tissue culture (micro propagation) in which case you should buy on sight because you don’t know when they will be offered again. If you know of somebody with a plant you can grow them by layering (we did an Outdoor Classroom on the topic about six weeks ago) or if you find any seed on a plant, they are straightforward and reasonably consistent from seed although you will get some variation from the parent. Alas some of the common named varieties don’t set much, if any, seed at all. 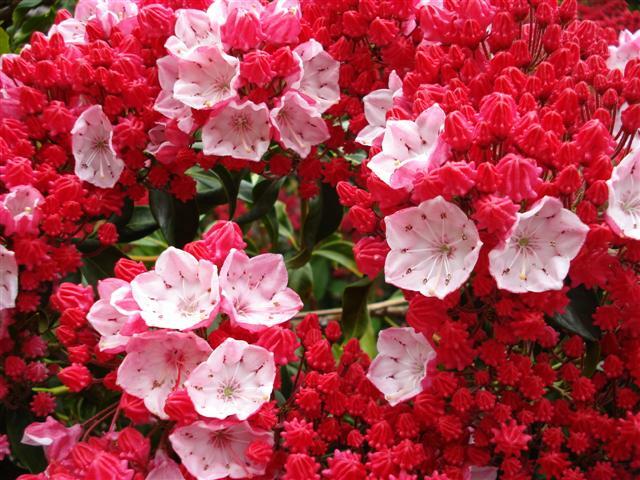 This entry was posted in Plant collector and tagged Abbie Jury, calico plant, kalmia, Kalmia latifolia "Ostbo Red", mountain laurel on 20 November 2009 by Abbie Jury.